A luminous fragrance that portrays an aquatic and pure setting sublimated by armful of delicate flowers, a touch of fresh and thirst-quenching notes and a comfortable veil of amber and crystal musk. The notes include cactus sap, cumbava (kaffir lime) zest, cyclamen, white lotus, peony, driftwood, salt flower, amber and crystal musk. 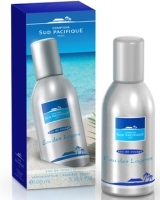 Other recent launches from Comptoir Sud Pacifique: Mage d'Orient and Eau de Naphé. Adidas has launched Fair Play, a limited edition fragrance to celebrate the 2008 football (that's soccer, for those of us in the United States) season. Fair Play features notes of fresh fruits, sea breeze, lavender, violet, cardamom, teak wood, patchouli and amber.